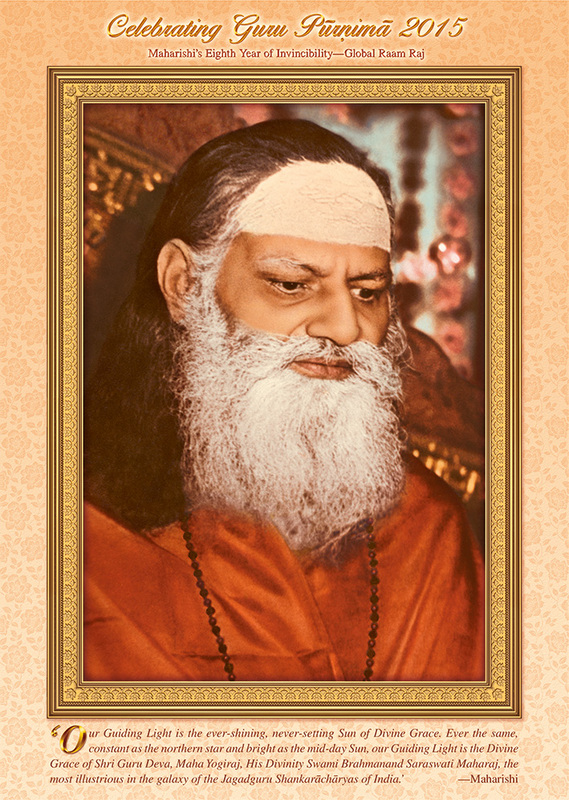 On every Guru Purnima Day, Maharishi always recalled the greatness of his teacher, Guru Dev. Read that beautiful, profound, inspiring description in Our Guiding Light, quoted in His Holiness Maharishi Mahesh Yogi, Thirty Years Around the World—Dawn of the Age of Enlightenment (Vol.1, 1986). In this special video, recorded July 8, 1971, on a Thursday, the Day of the Guru, also during that special Full Moon of the year, Guru Purnima Day, Maharishi celebrated this special Day of the Master describing how he first met Guru Dev and came to serve him. In this 1961 audiotape recorded on Guru Purnima, Maharishi spoke about the exceptional life of Guru Dev, Swami Brahmananda Saraswati, as a young boy in the ashram of his master Swami Krishnananda Saraswati. In this video taped April 9, 1972, Maharishi talks about Guru Dev, and the history of the TM movement, how it innocently started in India, then spread to Europe and America. The first 4.30 minutes includes the silent movie of Guru Dev. Listen to Peter Wallace’s story of how he met Maharishi. More articles, interviews, and videos of Maharishi Mahesh Yogi. Enjoy this Bhajan sung on Guru Purnima from the Maharishi Channel. Here is a post from GURU PURNIMA 2010. See Frances Knight shows paintings of Vedic Masters and Vedic Dieties at ArtFiftyTwo in Fairfield Iowa. Oct 2018, Steve Van Damme wrote a comprehensive personal answer to a question on Quora: What do TMers think about Maharishi’s character? This entry was posted on July 31, 2015 at 7:49 am and is filed under Articles. You can follow any responses to this entry through the RSS 2.0 feed. You can leave a response, or trackback from your own site.